We host and organise a multitude of fundraising events including 24hr marathons, skydives, gala dinners, and football matches. These events help us to raise funds to increase participation, and improve playing facilities within UK tennis clubs and venues. Our most recent project I Play 30, provides free weekly tennis sessions for players with disabilities and we currently operate I Play 30 sessions at 17 venues throughout the UK. A huge thank you to everyone that took part and made the 24 hr Tennis Marathon a success! A special well done to Marcus Willis and Lucie Ahl for playing continuously, and to all the pros that joined them throughout the 24 hours. Jocelyn Rae presented the MND Association with a cheque for nearly £3K following the successful 24hr Marathon and skydive. Joss has been one of the best doubles players in GB for the past 5 years, winning over 20 WTA / ITF titles. With a WTA highest world ranking of 67, Joss made the 3rd round of the Australian Open (2016), and the QF of the Mixed Doubles at Wimbledon (2017). She was a permanent fixture in the GB Fed Cup Team from 2011-17, but the highlight of her career came at the 2010 Commonwealth Games in Delhi where she won a Gold medal in the Mixed Doubles with compatriot Colin Fleming. 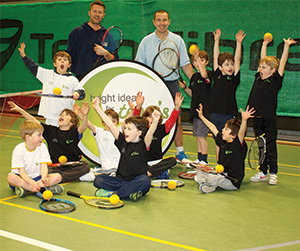 Tim Henman tells Surrey Life how he is delighted to support Bright Ideas for Tennis. Read the whole article in Surrey Life or use the link below.